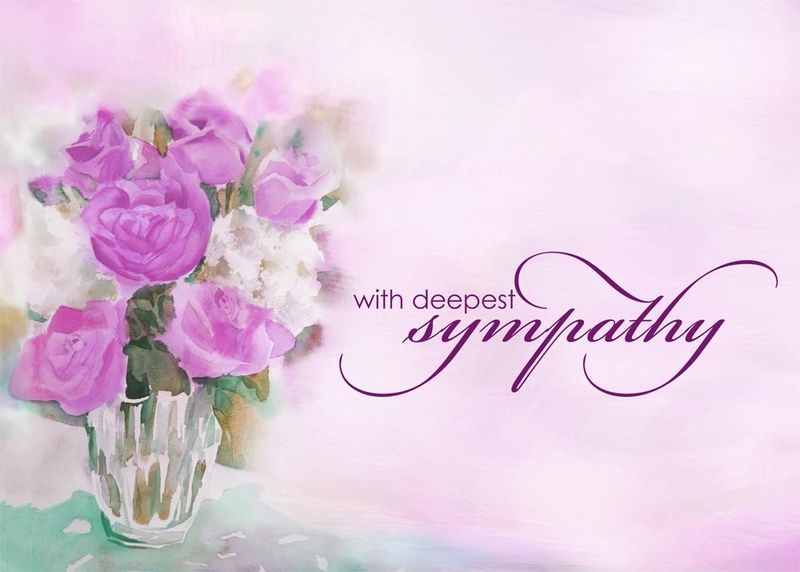 One of the hardest things about writing sympathy cards is figuring out what to say. Often, people find it hard to convey their feelings and thoughts during such times. For this reason, it is important to have some sort of reference when you’re writing the message on the card. This makes the process much easier as you will find the right words to express exactly how you feel at that moment. Below, you will find a list of warm and suitable sayings to act as a guideline. You can use them as they are or customize them to suit your situation. The most important thing is to capture the gravity of the moment with your words. The recipient will feel appreciated and loved for taking the time to honor them in their time of grief. You should keep the sympathy message short and succinct. This is especially so if the message that came with the card already conveys the message you want to pass along or if the deceased was not well known to you. While being brief might seem somewhat cold from the outset, it can actually come across as caring and warm when done right. You’re in our prayers and thoughts as you go through this trying time. Deepest sympathy as you mourn Paul. If you knew the deceased but do not know the family, mention your connection in the card e.g. we worked together. The bereaved feel a great sense of comfort when someone speaks highly of the deceased. Don’t use this kind of message if the deceased was not well known to you. If you genuinely admired the person let the bereaved know. She was an amazing person who lived a remarkable life. I share in your sadness as you mourn your dear sister. She was unlike anyone else, a true original. I celebrate the life of Dan and mourning them with you in this trying time. Letting the bereaved know that you share in their sorry is somewhat comforting as they know they are not alone. This might seem counterintuitive, but it works. I’m deeply saddened by the loss of your daughter. She’ll be forever in our hearts. I’m missing John along with you. With heartfelt condolences. Wishing the bereaved peace, comfort, hope, healing or peace can be very uplifting. You can send a comforting message as part of a longer one. May all the good memories comfort you. I’m with you in thought and I wish you comfort and peace as you remember Paul. If you strongly believe in the concept of faith as the basis of life, you shouldn’t be afraid to let your belief show when you’re writing a sympathy message. You can wish the recipient God’s comfort and peace during the difficult time. May the Good Lord be with you in this time of sorrow. If you can offer support by helping with arrangements, housework or any other form of help, you can mention it in your message. It will be highly appreciated. However, you should make sure that you’re in a position to follow through on your offer. Though I cannot take the pain away I want you to know that in me you have a shoulder and an ear. I’m thinking about you. You can always reach out if you need any help. I realize this is a difficult time for you. If there is anything I can do to help, please let me know. To make it even more impactful, you can try to be more specific with your offer. If you have a few quotes that can be comforting or have some that had some special meaning to the departed, you can include them in your message. Got some favorite words of comfort or healing? Or do you know of some words that had special meaning to the deceased? Feel free to quote them when you sign your card. When I lost my brother, these words by Hellen Keller comforted me. I hope they’ll comfort you too. The first condolence message shouldn't be the last. You can follow up with a few more messages after a few weeks. This will make the bereaved party deal with the loneliness associated with losing a loved one. The pain doesn’t fade when the cards stop streaming in. I’m still here for you. I just thought I’d let you know that I’m remembering Paul on his anniversary and sending caring thoughts your way. We know Thanksgiving will not be the same without George, but you’ll be in my thoughts and prayers during this time. It’s easy to make tactless or trite remarks in your message that might offend the recipient. It is therefore important to be aware of some of the comments you should steer clear of. Never write comments like “I know how you feel” or “it is all for the best”. This comes off as very insensitive as they are the ones who know how exactly they feel and what’s best for them. Never try to compare their loss to one you have had. It doesn’t help. Avoid making comments such as “Paul lived a full life”. The person will only feel sad as they would have wanted them alive. Avoid saying “time heals all wounds”. While this is actually true. It would be best to avoid mentioning it in the card. Do not imply that it was the right time for the deceased to pass on. Make sure to keep it short and succinct. A few sentences will do. You shouldn’t go out of your way to fill the card. Don’t try to be cute with titles. Address the recipient with a simple “Dear” followed by the person’s actual name, not a nickname. Use a pen with black or blue ink. Don’t use flashy colors as they don’t capture the solemn mood of the moment. Blue and black are appropriate and dignified colors for a sympathy card. Only send less formal messages to close family and friends. You can address them by their nickname or first name and close with an informal tone. For example, love Mark. Sympathy cards from the office should be signed as coming from all the office members e.g. From the Realty Associates team. Make sure to call after the funeral to find out how they are. This is when they’ll be most alone and vulnerable. Make sure you’re aware of the religion and beliefs of the deceased before penning anything that might be controversial.